Kim Kardashian is the latest celeb to be pictured wearing Nicole Richie's House of Harlow jewels. Kim was spotted leaving the pascal mouawad boutique. Pascal Mouawad is the designer who helped Nicole Richie develop and launch her House of Harlow 1960 jewelry line. 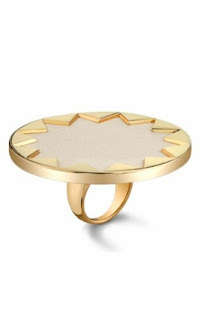 Kim Kardashian was pictured wearing the cream House of Harlow 1960 starburst ring. Credit Images of Kim - x17.